Another troubling sign that the ‘race card’ is being exploited in the country’s politics. More than 250 licensed non-government organizations in Malaysia are planning to mobilize 30,000 people on September 16 to protect and promote Maruah Melayu (Malay dignity). The event also aims to show support for the beleaguered leadership of Prime Minister Najib Razak, who is being implicated in a corruption scandal. 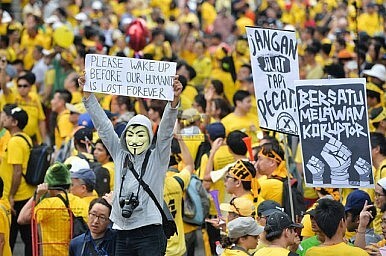 The event was clearly organized to counter the Bersih (which means ‘clean’ in Malay) protest last August 29 and 30, which gathered more than 100,000 people in Kuala Lumpur. Some leaders of the Malay Pride Rally have ridiculed Bersih as a Chinese conspiracy. To prevent the Chinese protesters from undermining the government, they urged their fellow Malays to join the September 16 gathering and to wear red in order to oppose the yellow color of Bersih. This framing of the issue is rejected by many who insist that it is a distortion of the real politics of Bersih. While it is true that Chinese protesters were present during the Bersih protest, they were joined by Malays and other citizens who believe that Najib must resign and that a clean election is needed to promote good governance in the country. Last month’s Bersih, and the three previous Bersih protests, didn’t pit the Chinese versus the Malays, although some allies of the government wanted the public to believe that racial sentiments are undermining the country’s stability. From the beginning, the issue was about corruption and abuse of power by the ruling coalition, which has been in power since the 1950s, yet leaders of the Malay Pride Rally continue to speak about Chinese machinations. Even a lawmaker from the Pan-Malaysian Islamic Party (PAS) has warned against using the race issue in local politics. “It is their right (to hold a rally) but we must not get into the mindset that Malaysia is only for one race. This will eventually cause tensions among the races,” said PAS lawmaker Mahfuz Omar. This point was echoed by several influential Muslim organizations, which issued a statement against the planned demonstration. “We do not redeem our honor and dignity by blaming other races whilst helping an embattled political elite cling to power,” the statement read. Mahathir was one of those who joined Bersih, though he claimed he was only supporting the call for Najib’s removal. Though Najib arguably stands to benefit from the so-called Malay Pride gathering, the government has distanced itself from the rally and the police has refused to give a permit to the organizers. Whether or not the rally ends up drawing more crowds than Bersih, it highlights a dangerous turn for Malaysian politics where the race card is increasingly being exploited by some groups and politicians to further their divisive political agenda. What’s Behind Calls for Independence in Sabah? Discontent is still running high in Malaysia’s Sabah, despite promises of redress by the new government. Rising Challenges Ahead for Malaysia’s New GovernmentCan Malaysia’s New Government Deliver on Reform?Why Mahathir Is Refusing to Remove Unpopular LeadersWhat Does the Cameron Highland By-Election Mean for the Orang Asli?Where Is Malaysia’s Mahathir-Anwar Transition?